Another convoluted story I'm afraid. You see I'd always wanted a wireless router so that we could share a wired internet connection between our 3 desktop pcs, then have a wireless connection for my old Toshiba Laptop, but they're not cheap and I really couldn't justify spending £70 on something that would just basically allow us access to the internet without having the main pc on all the time. Help came when our Breville Cappuccino maker broke for the second time, and my wife couldn't decide what she wanted to replace it, as we had bought the coffee maker from Argo with Gift Vouchers we received for Christmas. A "wireless router!" I replied when she asked me what I thought we should get, and before she could argue I was down to our local Argos swapping the broken coffee maker for a brand new Belkin ADSL Modem with Wireless Router. The way I've got my home network set-up right now is with a network switch box. It works fine for a wired set-up, but the obvious drawback is the adsl usb modem is connected to the main pc, so when that pc is the other pc's lose their internet connection. Getting the Belkin router out of the box I quickly read the quick-start guide then dived in and set it up. The main pc could not see the router when I flashed everything up, and it kept trying to dial out using the old broadband connection. The secondary pc's could both access the server, and after using the built in wizard to enter my broadband details they both had internet access. I played around with the main pc to try to get it to work, to no avail, so I decided to re-install Windows XP. I had been meaning to do this for ages anyway as that pc was running slow, and now was a good a time as any. The reinstallation went smoothly, and as part of the set-up process XP automatically set up the internet connection & registered my copy of XP automatically with no fuss at all. After testing all the pc's the internet connection was strong and fast. I did have a few problems in the evening, but don't know if that was due to my isp on a busy Sunday night. So far so good, now it was time to test the wireless part of the router. 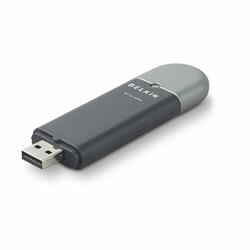 My problem was that I had a Belkin USB wireless G adaptor and a Belkin wireless notebook adaptor for my laptop - but I had never got them working before. I had installed them separately, but never seen another wireless network on the utilities screen. Both were second hand, so I had no idea if either were actually working. First I tried the network card, with no luck, so I uninstalled the Belkin Wireless utility and had a go with the USB adapter. Bingo! My wireless network appeared first time, and my Toshiba Satellite laptop connected to the internet. Great! The connection was fast, but I was in the same room as the router, so it was time to try it at the opposite end of the house. No luck. The laptop could see the network (and a neighbours), but when I tried to connect it just said "waiting for network" and gave up after a minute or so. The signal was strong, so I couldn't understand the issue. I moved our wireless home phone away from the router, and then moved the router to a more central location in the upstairs room, but I still couldn't get a connection. A quick search of the internet pulled up that it could be a channel conflict, so I switched from 11 to 5, and like magic it started working. So now I have a wired network for our desktop pc's, and wireless capability for the rest of the house for my laptop. Just what I wanted. 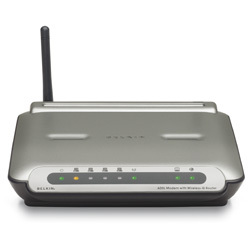 So I can recommend both the Belkin ADSL modem with Wireless G Router, and the USB wireless adaptor, to share the broadband internet connection in your home or small office. Apart from a few teething problems everything is now working perfectly. Job done.